(For an explanation of TheatreStorm’s rating scale, click here. The cast of Noël Coward’s “Hay Fever” at Stanford Repertory Theater. Photo Credit: SRT. Every time Walsh steppped on stage, my eyes bulged in sheer incredulity at such a marvelous comedic performance. In “Hay Fever” she plays Judith Bliss, an aging actress and the indomitable matriarch of the highly artistic Bliss family. The action takes place at a country manor where each member of this family has invited someone to stay for the weekend. Typical mayhem ensues. As the play is written by the great Noël Coward, it is a perfectly structured and highly amusing play. The play itself is a very classy affair, but the production forces many actors to read their lines with way over the top delivery. This is often effective, and provides for several sequences in the play that are filled with hilarity, but it also seems overdone. The best moments come when Walsh is onstage. With her strong figure and even stronger stage presence, every line she performs is a sort of micro adventure. The other actors onstage work excellently with her, though sometimes I wondered if it is their performance that makes it work or if Ms. Walsh is just acting well enough for the entire company. The latter seems a likely explanation, as once she exits the stage, the production can be dead in the water. Sure, the Coward amusements are still there and the play drifts by amiably, but the production at that point appears to be just presenting the material instead of elevating it. When actors are forced to give such over extended performances while the miracle lady is onstage, they have to give that same performance when she isn’t. And it just doesn’t work as well, especially when the characters were clearly not written to be such caricatures. It should be mentioned, though, that, happily, Ms. Walsh is onstage for a good three quarters of the production, If Lynne Soffer, the director, had just let every character act naturally, not only would the play work better when she was offstage, but the contrast could have provided some additional hilarity. Still, the play delivers some hearty laughs throughout. Annie Dauber’s incredibly well detailed and very handsome set works well. Overall, this production has more highs and lows than you might expect, but it is a very fun night at the theatre, and features a magnificently delirious lead performance. “Hayfever” plays at the Stanford Repertory Theater through August 9. For further information, click here. ‘Hay Fever” by Noël Coward, produced by Stanford Repertory Theatre. Director: Lynne Soffer. Set Designer: Annie Dauber. Costume Designer: Connie Strayer. Lighting Designer: Michael Ramsaur. Sound Designer: Brigitte Wittmer. Sorel Bliss: Kiki Bagger. Simon Bliss: Austin Caldwell. Judith Bliss: Courtney Walsh. David Bliss: Bruce Carlton. Clara: Catherine Luedtke. Sandy Tyrell: Andrew Amarotico. Myra Arundel: Deb Fink. Jackie Coryton: Kathleen Kelso. Richard Greatham: Rush Rehm. 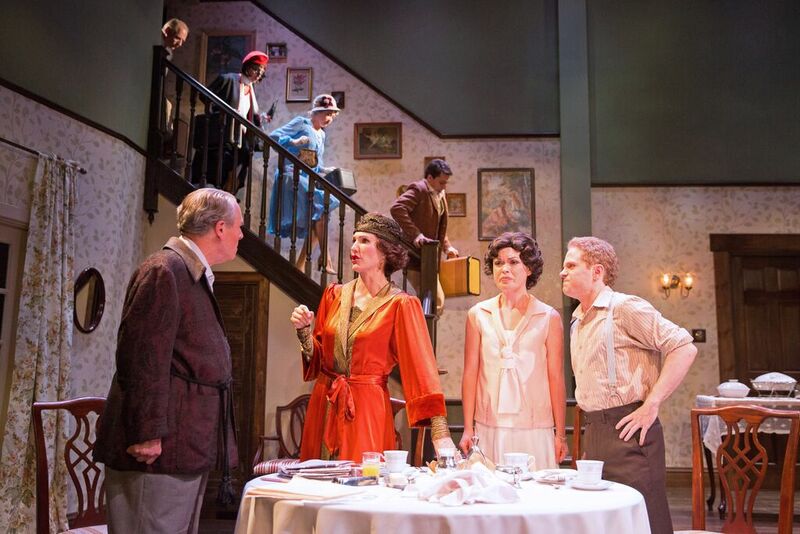 Posted in Reviews.Tagged Annie Dauber, Charles Kruger, Courtney Waslh, Hay Fever, Lynne Soffer, Mark Johnson, Noel Coward, San Francisco Theatre Reviews, Stanford Repertory Theatre, theatrestorm.